The Dart may have to wait until next summer to enjoy being turbo-charged to appear on screens in the new Fast and Furious film, but that isn’t stopping Mopar from giving it a makeover in time for this season. But sadly, this Mopar-ization comes with a limit. Only 500 of the them will reach sales floors. Dealerships are taking pre-orders now to get them in the hands of the lucky few who really want them. The lucky ones get their hands on a truly unique ride. 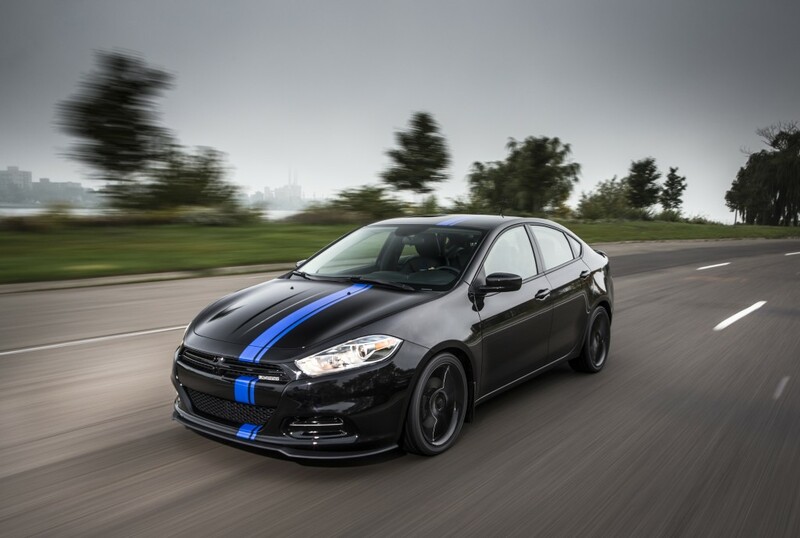 The outside is given the Mopar standard paint job of being coated in black with a cool blue racing stripe stretching from the front to the rear of the Dart. This is the same paint scheme that’s been used previously whenever the parts maker has gotten their hands on a vehicle, such as the Dodge Charger or the Challenger. That same quality of design is evident in the interior as well. The seats are done up with Katzkin leather. And the rest of the cabin’s look is similar to the exterior with blue accents on a predominately black theme on the driver’s seat, the steering wheel, and the instrument paneling. Mopar is notorious for the power of their product and it only makes sense that whenever they take a vehicle, such as the Dart, under their wing, that they prove why they’re considered one of the best in the business. The engine is a Multiair turbocharged 1.4-liter four cylinder. It also has six-speed manual transmission. The limited edition Dart also comes with the 8.4-inch Uconnect screen and system, wireless charger, premium Mopar floor mats, and a sport-pedal kit. For bragging rights, the list of features goes beyond what’s in and on the car. The 500 individuals who purchase the limited edition will also get a personalized plate that has the vehicles specifications as well as a unique identification number and production date. The last piece of the proverbial pie is a sketch of the car signed by Mark Trostle who is the Chief Designer for Mopar. Not too shabby of a deal for a limited edition that has a manufacturer’s suggested retail price of $25,485. For more details on the 2013 Dodge Dart and other Dodge products, visit Bayside Chrysler Jeep Dodge online. We have our new and pre-owned inventory available for viewing. For visitors in need of auto repair and service, schedule a time to come in with our high-quality service department. Like us on Facebook and follow us on Twitter for more auto news and for our monthly parts and service specials.